She had four sons, Talib, Aqeel, Ja'far and Ali (A.S) and two daughters, Umme Hani and Jumana, and above all Mohammad (S.A.W) her adopted son. Her home was the real cradle of Islam. Both Muhammad, the future Prophet of Islam, and Ali, the future paladin of Islam, were born in her house, and they grew up in it. Both of them were the "products" of her education. Her husband Abu Talib (A.S), figures as the greatest benefactor of Islam. She shared the distinction with him of rearing and educating Mohammad (S.A.W). "Naboowath ho, Imamamath ho, Wilayath ho, Shahadath ho Sabih ne Parwarish sehne Abu Talib me payi hai"
Aqeel Ibn Abi Talib He was born in 590. His Kuniyath was Abu Yazd. He accepted Islam at the time of Hudaibiya and reached Madina in 8th hijri. He fought in the Battle of Mu'tah. He became blind in his old age. He died at the age of 96. His son Muslim Ibn Aqeel was The first Martyr of Kerbala. He was Safeer-E-Hussain to Kufa. Muslim Ibn Aqeel's two sons Mohammad and Ibrahim also met martyrdom in Kufa. Ja'far Tayyar was a famous General. He led the forces of Islam in the battle of Mu'tah and was martyred in the same battle. His both arms were severed and he held the standard of Islam with his teeth. He was the Winged Martyr of Islam. Fatima Bint Asad was exceptionally fond of her son Ja'far, she loved him more than the others because he resembled Muhammad [S.A.W] very much, and was extremely intelligent. But for the sake of Islam she bore the separation from him and his wife, Asma bint 'Omais, (when they migrated to Abyssinia on the Prophet's orders with the first group of Muslim migrants ). He seemed to have inherited the family's mastery over language and was also an eloquent speaker who could win people over to his viewpoint. It was with this same skill that he had won over the king of Abyssinia when the Quraish appealed to him to surrender the Muslims to them. He had eight sons. His son Abdullah married Zainab (S.A) and Mohammad married Umme Kulsoom (A.S). Janab Abdullah Ibn Ja'far's sons, Aun and Mohammad were martyred on the lands of Kebala. Ali Ibn Abi Talib Fatima Bint Asad 's younger son was Ali Ibn Abi Talib(A.S). No introduction is needed for this great Imam. But I like to mention some facts of his birth as it also concerns the great Lady Fatima Bint Asad. She stayed in the Ka'bah for three days and had the privilege of eating the fruits of heaven. 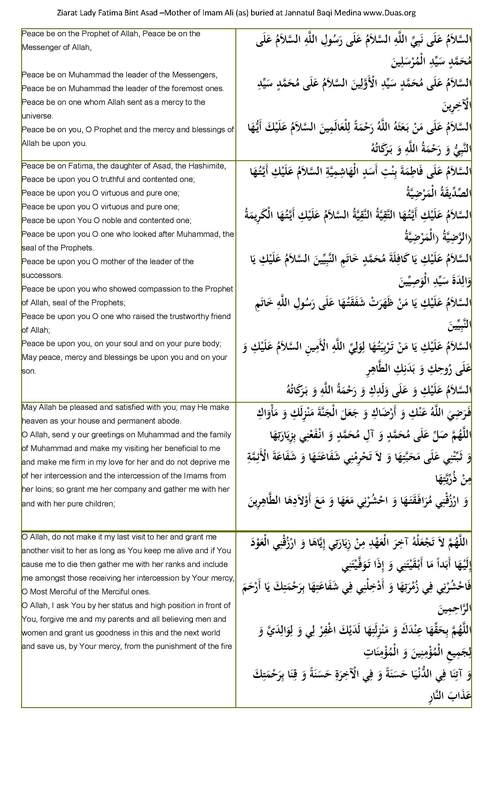 At the time of the birth of the Prophet Jesus (Isa) (P) his illustrious mother was forced to leave the Holy House. A voice said to her: O MARY (MIRIAM)! LEAVE THE BAITU'L-MUQADDAS, SINCE IT IS THE PLACE OF WORSHIP AND NOT OF CHILDBIRTH. But when the time of Hazrat Ali's birth approached, a voice was heard saying: O FATIMA BINT ASAD! ENTER THE HOUSE (KA'BAH). Fatima bint Asad leaned against the wall of the Ka'bah to rest. Miraculously, the wall opened. Fatima bint Asad entered and the wall closed behind her. 'Abbas bin 'Abd al-Muttalib, the Prophet's (S.A.W) uncle witnessed this miracle. He and his companions rushed to the gate of the Sacred House, which was locked, and tried in vain to open it. Understanding that the Divine was at work there, he and his companions ceased to interfere. The news of this incident soon spread throughout Mecca. Imam Ali (A.S) was born within the Ka'bah with his eyes closed and his body in humble prostration before the Almighty Allah. Fatima stayed in the Ka'bah for three days and as the fourth day approached, she stepped out, carrying her baby in her arms. She found the Holy Prophet (S.A.W) waiting to receive the newly-born child in his anxious arms. So the first face that little Ali (A.S) saw in this world was the smiling face of the Apostle of God, Muhammad (S.A.W). Imam Ali's (A.S.) birth inside the honored Ka'bah is unique in the history of the world. Neither a prophet nor a saint was ever blessed with such an honor. (A Brief History of the Fourteen Infallibles, World Organization for Islamic Services, (Tehran: 1984), pp. 51.52.) It is an undisputed historical fact recognized by all historians that the Holy Ka'bah is the birthplace of Ali bin Abi Talib (A.S). Glad tidings were brought to Abu Talib and his household. Upon their arrival at the Sacred House they saw Muhammad al-Mustafa (S.A.W) there with the child in his arms. (Ibn al-Sabbagh al-Maliki, al-Fusul al-Muhimmah fi Ma'rifat al-A'immah, Ch. 1, p. 13.) He carried the baby Ali to the house of Abu Talib, where he, himself was brought up. Now we will refer to the funeral of Fatima Bint Asad (A.S) during the Prophet's (S.A.W) time. When Fatima Bint Asad (wife of Hazrat Abu Talib and mother of Imam Ali (A.S)) died,(23rd Safar as per a tradition) the Holy Prophet (S.A.W) was very much grieved. The Holy Prophet (S.A.W) "remained under her bier" means that he did not carried it on his shoulder. In East Africa, a peculiar custom has been adopted: the son of the dead person remains "under the bier" literally; instead of carrying the bier or helping others carrying it, he places himself between those who are actually carrying the bier, and inconveniences them. Then the Holy Prophet (S.A.W) put her bier near the grave, and entered the grave and lay in it. Then he stood up and took the body in his hands and laid it into the grave. Then he put his face near hers whispering to her for a long time, telling her "your son, your son". Then he came out, filled the grave and shaped it properly. Then he inclined towards the grave, and people heard him (S.A.W) saying: 'There is no god but Allah. O Allah, I am giving her to thee in trust' . "Today I lost the righteousness of Abu Talib: Verily, she was so (kind to me) that whenever she had any good thing, she gave it to me, instead of using it for herself or for her own children. And I said once that on the Day of Judgment people would be assembled naked. She said: "Oh, the shame!" Therefore, I assured her that Allah would resurrect her with clothes. And I described the squeeze of the grave, and she said: "Oh, the weakness!" So, I guaranteed to her Allah would save her from it. It was for this reason that I gave her shroud from my own robe, and I lay down in her grave. And I knelt near her to teach her (the answers of) what she was being asked. And verily, she was asked about her Lord; and she said, "Allah is my Lord"; and about her Prophet, and she answered, "Muhammad (S.A.W)". Then she was asked about her Wali and Imam, and she perplexed and hesitated a little; so I told her "Your son, your son". And she replied, "My child is my Imam". Then the two angels went away and said, "We have no authority upon you, sleep as a bride sleeps (with no worry at all)." Then she died again (i.e., her soul was taken out of her body again.)" "May God bless your noble soul. You were to me like my own mother. You fed me while you yourself went hungry. Your aim in doing so was to please God with your deeds." He often said, "I was an orphan and she made me her son. She was the kindest person to me after Abu Talib." "O God! Life and death are in Thy hands. Thou alone will never die. Bless my mother, Fatima bint Asad, and give her a mansion in Heaven. Thou art the Most Merciful." "My dear mother, may Allah keep you under His Protection. Many times you went hungry in order to feed me well. You fed me and clothed me on delicacies that you denied yourself. Allah will surely be happy with these actions of yours. And your intentions were surely meant to win the goodwill and pleasure of Allah and success in the Hereafter." "She kept her children hungry but made sure I got enough to eat. She did not comb her boys hair but put oil on my head and combed my hair". ASSALAMU ALAA NABIYYILLAH. ASSALAMU ALLAA RASULLALAH. ZAHARAT SHAFQTUHA ALAA RASULLILLAHI KAHATIMIN-NABIYYIN . ASSALAMU ALIKI YA MAN TARBI-YATUH A LIWALIYYILLHI AMIIN. ALIKI WAALAA WALADIKI WARAHMATULLAHI WABARAKATUHU. WAADKHILNII FII SHAFAATIN BIRAHMATIKA YAA ARHAMAARAHIMIIN.